I'm planning to write a review on this extended battery this weekend. If you have any questions that you'd like me to address, please let me know. If you don't like having to have your phone tethered to a charger throughout the day, then I would recommend considering this case. It's not convenient for everyone to plug their phone in when they need a recharge, nor is it ideal to lug around a bulky power bank. This phone frees you from having to remember to plug in and it's less bulky than most power banks since it's attached to your phone. The battery case offers enough juice to give you more than a full charge. I consider myself a heavy user, and this case provided enough power to last me a full day and then some. I unplug my phone at around 6 AM, then, by the end of my day at around 11 PM, the battery case would be depleted or very nearly so, and my phone's battery would be at 40% or more . Getting through an entire day without having to plug in is the goal, so this case meets and exceeds my battery life expectations. For my testing, I'd begin charging my phone when it drained to about 40%—to start or stop charging, you hold the button on the back for a few seconds—then I would charge it until it reached about 80%. I'd repeat throughout the day a few times as needed. As already mentioned, by the end of the day, I'd still have about 40% or more battery left in my phone and the case would be either depleted or close to being so. My screen-on-time during my week of testing was between seven and eight hours on average with 40% battery remaining. These results are comparable to using my phone without the extended battery case in which I'd fully recharge my phone at least once and still end the day at around 40%. Had I been unable to fully charge my phone, though, I would have been at a disadvantage compared to using the always-there extended battery case, so the benefit of using this extended battery case is that it's attached to your phone and is ready to provide a charge as needed without you having to track down a charger. I didn't really test charging times, but I will point out that if you're charging the case and phone together overnight and you want a full charge, then you'll probably want to make sure you're getting a full eight hours of sleep. The two nights I charged the phone and case together, neither were fully charged when I woke in the morning. On the nights that I charged them separately, they would both be fully charged. This is kind of a non-issue, but it's still worth noting. The extended battery case will add bulk to your phone, but it's less bulky than having to carry around a power bank. I actually just recently upgraded to the V40 from the V30 and I immediately started using the V40 with the battery case, so I had to to get used to a larger phone in addition to the extra bulk. It's still big, but I got used to using the V40 in the case by the end of the week. It helps that I also purchased a Ringke ring grip (https://www.amazon.com/gp/product/B0...cUvbUpU6528760), though sometimes I'd still hold my phone without sliding my finger in the ring for support. The case doesn't have the best grip, but it's not what I'd call dangerously slippery. 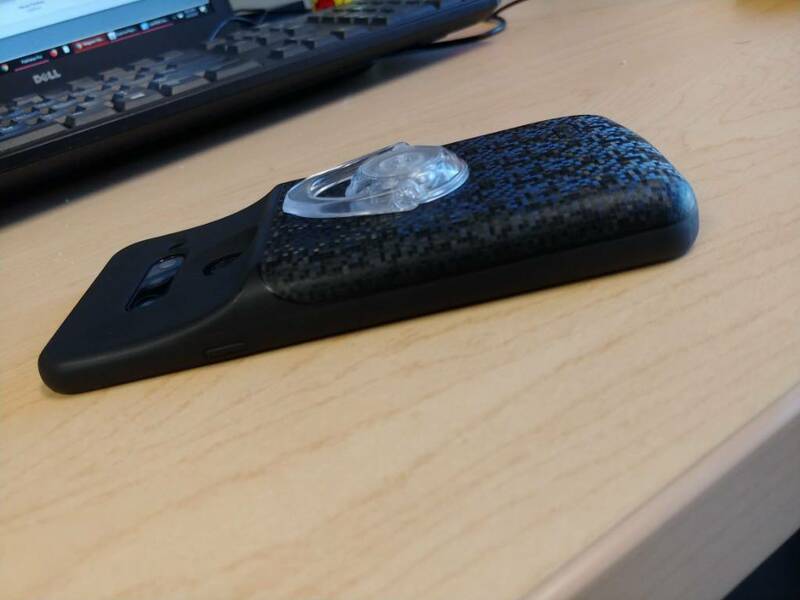 A smart design choice would have been to use a material with much more grip so that we could worry less about accidental drops, especially because this case does not inspire confidence when it comes to protection. I'd say the biggest downside about this case is that I'd be terrified if I dropped my phone while using it. The corners have some protection, but the lip is almost non-existent over the sides of the phone. For this reason, I'd highly recommend something like a ring or pop socket to use while holding your phone. The case itself of good quality, but it wasn't designed with protection in mind. Aside from that, it has a cool look. Its design reminds me of the Nexus 4. It's bulky but not nearly as bulky as some ZeroLemon cases that I've used in the past. The size is manageable and not too uncomfortable once you get used to it. When it comes to attaching an extended battery to the charging port of your phone, you really can't come up with a better design than this. The only drawbacks are literally the lack of protection and the less-than-desirable grip. If you are in the market for an extended battery case, then I can recommend this. You already know what you're getting into in terms of size and bulk, and I can attest that the battery life added is more than enough. The only real concern is protection (and why I suggest a pop socket or similar product). Android 9 says : "Battery usage data isn't available"?